We are a full-service Pennsylvania chimney sweep and repair company. Our motto is: “The Right Way for the Right Price”. Simply put, If it has to do with your chimney and/or hearth appliances we have the credentials to build it, install it, and/or repair it the right way at a fair price. Read more about Antrim’s, A Good Sweep Chimney & Masonry and why we are a different kind of chimney repair company. If you are looking for a company that cares about its customers and has the reviews to back it up, Antrim’s might be the one for you! Chimney sweep, chimney repairs, chimney inspections. Look at all of our chimney repair services. 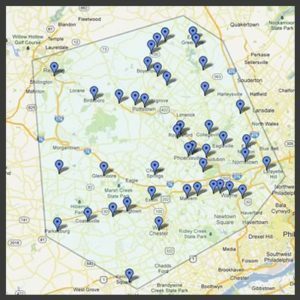 Montgomery County, Pa, Chester County, Pa, Berks County, PA, Northern Delaware County and Parts of Philadelphia, Pa.
Click here to see our current offers and discounts on your chimney and dryer vent services! Don’t forget to ask about our client referral program as well. We offer discounts on our superior chimney service to not only you, but the person you refer as well! Are you tired of having “Just a Job”? Do you like working with your hands? Do you enjoy the outdoors? How about working in different locations regularly? Antrim’s is growing and we are actively seeking new motivated individuals to join our company. Click the button below to learn more about the possibility of having a real career instead of “just another job”.